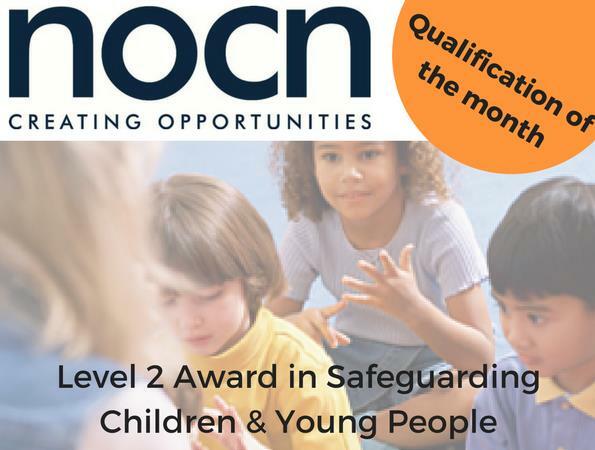 NOCN’s Level 2 Award in Safeguarding Children & Young People is our qualification of the month for March and will support learners to understand the ways in which young people may be vulnerable to harm, abuse or exploitation and the skills and responsibilities required to keep young people safe. This qualification is available to learners aged 16years or over looking to develop the skills and knowledge required for employment in environments/sectors where they are required to have an understanding of the principles of safeguarding or, have a duty of care to children and/or young people. This qualification supports the Level 5 Education and Training Higher Apprenticeship Standard and will prepare learners for employment in a broad occupational area by developing their knowledge and understanding of the safeguarding of children and young people. The qualification covers current legislation relevant to the safeguarding of children and young people and explores how to recognise and respond to critical incidents, including illness, injury, security events and emergency situations. In addition, the qualification focuses on identifying and responding to evidence or concerns that a child or young person has been abused, harmed or bullied. Progress on to higher-level qualifications within environments/sectors where they are required to have an understanding of the principles of safeguarding or, have a duty of care to children and/or young people. This qualification is included within the Level 5 Education and Training Higher Apprenticeship Standard. The standard states that Further Education Learning and Skills Teachers must achieve a Level 2 Safeguarding qualification prior to their end-point assessment.